Nesco FD-28JX Jerky Xpress Food Dehydrator... 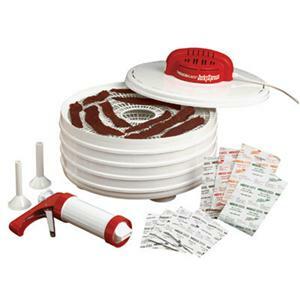 This dehydrator and home making jerky kit includes everything needed to make delicious home made jerky. Just add ground meat. All new, 350 Watt, fixed temperature, top down power head is perfect for the beginner or an experienced jerky maker! Makes great tasting beef jerky or venison jerky! There are four different flavors of jerky spices included with this unit, Hot and Spicy, Teriyaki, Original, and Pepperoni. Includes: Four Trays; Trays are 13 1/2" in diameter; Jerky Gun with 3 Tip Attachments; Four Spice and Cure Packs; 350 Watt, Fixed Temperature, Top Down Power Head; Patented Fan Flow Radial Air Drying Technology.